I believe there are two kinds of people in the world. Those who cook with condensed “cream of” soups, and those who think it is a sin. I like to consider myself someone who does not, however I do have a couple recipes in my arsenal that are too good to pass up, and they do contain condensed soups. This Chicken a la King recipe is one of them. It is so easy, but is still fancy enough to serve at a dinner party. And because of the addition of sour cream, and the fact that you slow cook it for 3-4 hours, it really has a homemade taste. Place chicken, peas, corn, pepper, soup, mushrooms and milk into a slow cooker. Turn it to low and let it simmer for about 2 hours. Add the sour cream and simmer for another 1-2 hours or until bubbly and thick, stirring occasionally. Bake 4 puff pastry shells according to package directions. 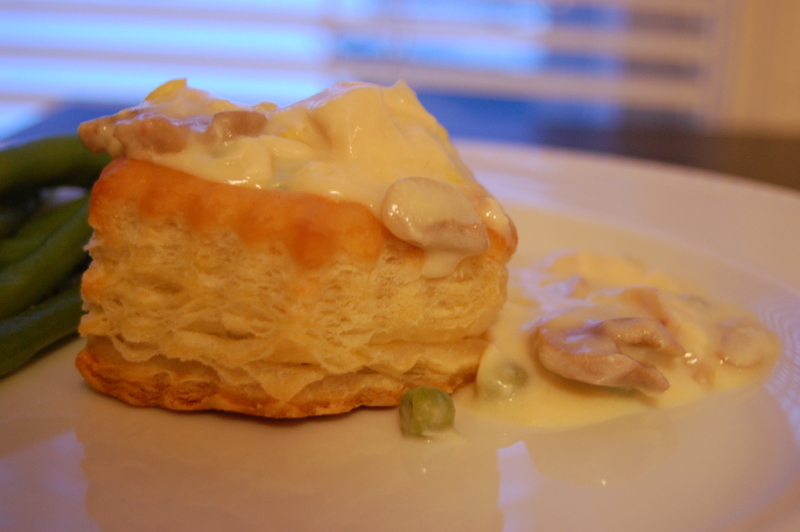 When ready to serve, place puff pastry on a plate and pour Chicken a la King mixture on top. Chicken a la King can also be served over toast or brown rice if preferred. This recipe can easily be doubled for a larger crowd and the left overs freeze wonderfully! I really need to make that this winter! It looks so good! I’ve actually never had chicken a la king, I really should try it. I have a couple recipes that use canned soup myself, it’s just perfect for comfort food. Heh. I’m with you on the condensed soup issue. I tend to avoid them (too much sodium, goo); but, I have a couple of recipes that really make good use of them. Chicken a la King… what a great retro dish! Haven’t had it in years, but it sounds so good.